Alexandru Şerbănescu - from Infantry to Aviation. Written by Victor Niţu, Octavian Ghita and Dariusz Tyminski . Romanian top aces on one photo, from left: Constantin Cantacuzino (60), Ion Dicezare (5), Teodor Greceanu (27), Alexandru Şerbănescu (47), Ion Milu (45). 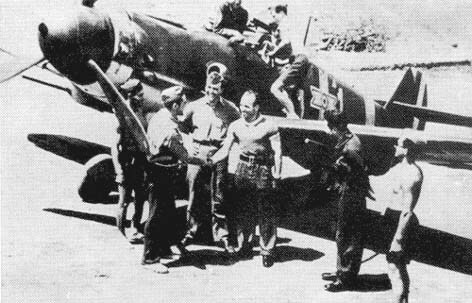 In the text a photo of Şerbănescu (in center) just after a successful sortie, in front of his Bf 109 Ga-4/R6 number 1 yellow (look also at profile bottom). Alexandru Şerbănescu is one of the leading aces of Aeronautica Regală Română (ARR - Romanian Royal Aeronautics) in WWII. He was born in 1912. In 1933 he graduates the Infantry Officer School and is assigned to the 3rd Mountain Battalion, near Brasov. He is very appreciated by his superiors and in 1938 he is promoted to the rank of lieutenant. After the School Aerial Observers in 1939 he is admitted in the School of Air Force Officers. After the beginning of "Barbarossa", Şerbănescu requested a transfer to the Fighter Pilot School near Roşiorii de Vede. On 22 August 1942 he is assigned to the 7th Fighter Group (Grupul 7 Vânatoare), equipped with Me-109 E, and he flies his first war mission on 2 September 1942. His first kill was a Yak on 17 September and the second came on 25 September. He shot down a Hurricane on 20 January near Kudrief. 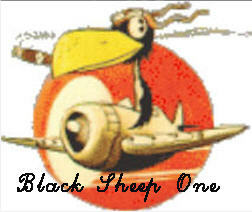 At the end of February, the Mixed Group (elements of the 5th Bomber Group and of the 7th Fighter Group) under the command of lt. cmdr. Nicolae Iosifescu was in a poor state. The men and the equipment were in badly need of rest. It was retreated in Romania to be rebuilt. On 6 March 1943, Alexandru Şerbănescu was promoted to captain. The Group received the new Me-109 "Gustav", which was an excellent airplane. On 29 March, the group was assigned to the JG 3 "Udet" and Cpt. av. Şerbănescu was given the command of the 57th Squadron. Until 1st June, when the Group was reassigned to the Romanian Air Corps, Şerbănescu got another 4 airplanes (2xYak-7s, 2xLa-5s). On 26 June, Şerbănescu and other 3 comrades were patrolling in the Kirpiscevo-Rumianki sector. They were attacked by 20-22 Spitfires. In the following dogfight, Cpt. av. Şerbănescu, Adj. Mucenica and Adj. Chirvăsăuţă got one each. Adj. av. Laurenţiu Cătană went to the ground together with the Soviet he had clashed with, after shooting down another two Spitfires. He was thought dead, but after the war he returned. He managed to jump, but landed in the Soviet lines and was captured. On 13 July, the best Romanian wing at that time (Şerbănescu, Milu and Mucenica) was protecting a Romanian Ju-88 formation. They were attacked by 10 Soviet fighters. Şerbănescu fired upon a Russian that was on Milu's tail, but he got away. Then another one suddenly appeared in front of him and he shot it down. He then found the first plane he attacked and this time he didn't miss. On 17 and 18 July, Cpt. av. Şerbănescu shot down 6 planes. On 18, he was on patrol with other 3 aieplanes in the Kuibashev area. After 5-6 min they saw about 10-12 Soviet fighters and engaged them. It didn't take long and two Yak-1s were going down in flames, both claimed by Şerbănescu. He took off on another patrol in the same area. They soon found a large formation of Il-2s (18-20) escorted by 10-12 fighters. He and his wingman, Adj. Mucenica, attacked the Sturmoviks, while the others protected them. Şerbănescu fired three times and finally the Soviet went down, right in front the the positions he was supposed to attack. The enemy fighters forced Alecu (as Constantin Cantacuzino called him) to defend himself. Even so he managed to attack another Il-2, which left a trail of smoke behind it as it was heading to base. He continued to shoot planes down in August (10). Thus he was rewarded the Iron Cross, 1st class on 17 August. On 20 August he was wounded in the face, but superficially, and on 30 August he received the "Mihai Viteazul" Order (the highest Romanian military honor) together with Cpt. av. Constantin Cantacuzino, Lt. av. Teodor Greceanu, Slt. Ion Dicezare and Of. echip. Ioan Milu. They were the best Romanian fighter pilots, which by that date had shot down more than 100 Soviet planes. On 10 October, Cpt. av. 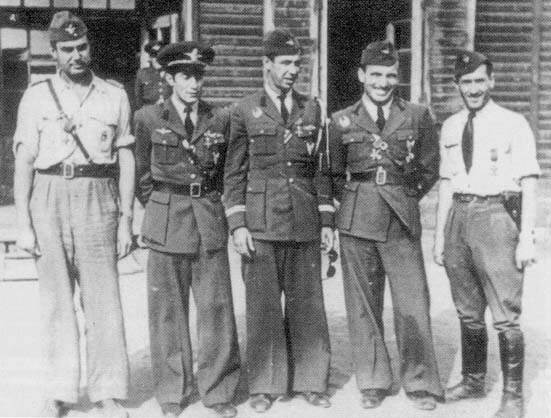 Alexandru Şerbănescu was on patrol with other 3 pilots (Muresan, Nicoară and Neacsu) after they had escorted some Ju-88s. They spotted Il-2s and were getting ready to jump them, when they were them selves surprised by Soviet fighters. Muresan was the first shot down. Nicoară "landed" in the Azov Sea (which is very shallow and he simply stood on his airplane and the water was only at his waist; he was later picked up by a German boat). Şerbănescu, in flames and with five Soviets on his tail, managed to reach the lines of the Romanian 4th Mountain Division and crash landed. That evening he was already at the 7th FG's airfield. The Soviet radio announced that the 7th FG was destroyed. The second day, a Romanian pilot managed to get through to a Soviet airbase and drop a message that invited them to see that the Group was still there. None showed up! On 23 October, the 9th FG replaced the tired 7th FG, but Şerbănescu and the other aces remained. He kept fighting and shooting down airplanes and on 13 February 1944 he was named the Group's commander. The Soviets were now in Romania and had already occupied northern Bessarabia and Moldavia, but they were stopped after fierce fighting, in which the pilots had a very important role. On 22 May, after escorting 12 bombers, Şerbănescu came to the aid of Cpt. av. Popescu-Ciocănel and his wingmen, which were under attack by Yaks and Aircobras. He managed to shoot down 2xP-39s and reached the number of 40 victories. On 11 June, Şerbănescu shot down his first American airplane: a B-17. It was followed by 2 Mustangs (31 July and 11 August). On 26 July 1944, 16xBf 109 of the 9th FG (Şerbănescu and Cantacuzino were at Bucharest) encountered a great formation of 98 American aircraft, returning from Russian airfields. In aerial combat the Romanians destroyed 11xP-38s, but lost 7 pilots. This loss was double heavy, because between them were Cpt.av. Popescu (12 victories) and Adj. Mucenica (24 victories), which was wounded and spent the rest of the war in hospitals. In combat, on 8 August 1944, was shot down another great ace: Ion Milu (45 victories). He was also wounded and spent a lot of time away from the front. Ten days later, five days before the armistice with the Allies, on 18 August 1944, Alexandru Şerbănescu took off for his last mission. In that day he and his 12 wingmen, together with 12 other planes from the 7th FG, attacked a swarm of Mustangs and Lightnings. When Lt. Dobran and Adj. Dârjan tried to clear his tail it was to late. His last words were: "I'm going down..."
Şerbănescu died in the line of duty like a real hero. He had 47 confirmed victories and 8 probable. He is on the second position after prince Constantin Cantacuzino (60 victories). After the death of Şerbănescu, all the fighters were retreated in front of the Americans until a new strategy will be adopted. Five days later, on 23 August 1944, Romania signed the armistice with the Allies. Bibliography: Vasile Tudor, "Un nume de legendă - Cpt. av. erou Alexandru Şerbănescu", Editura MODELISM, 1998. Here is a nice colored snap of Bf 109 E used in Grupul 7 Vanatoare on the Eastern Front. Below is the profile of Şerbănescu's "Gustav" Messerchmitt.